As we demonstrated, all mountain summits on an island or continent are connected to each other through the Divide Tree. Prominence shows us that all summits are not equal, and that there is therefore some kind of hierarchy of summit points in a given landscape. By looking at the key saddle, (as well as in Maxwell's investigation into hills and dales) we discovered that we can authoratively demarcate the boundaries between hills. These ideas are synthesized in an investigation of what I call the LINEAGE and the LINEAGE AREAS of mountains. Let's start again by looking at the key saddle. Just as everything between a summit and its key saddle must be somehow associated with the summit, everything past the key saddle must be somehow external to the summit. This begs the question of what lies beyond the saddle, and how it might relate back to a summit. Looking at the higher summits beyond the key saddle, we can detect several natural relationships that might indicate that a summit has a natural Parent. The picture in the following photo shows three mountains in the La Salle Range in Eastern Utah. Mount Peale is the highest. Mount Tukuhnikivatz is the next highest with an elevation of 12,489'. It connects to Peale at the key saddle 11,760 (40). South Mountain connects to Mount Tukunikivatz at La Salle Pass. It would be apparent to those who choose to think about such things that Mount Peale is a sort of natural parent to Mount Tukunikivatz, and that Tukunikivatz is a sort of subpeak on the slopes of Peale. 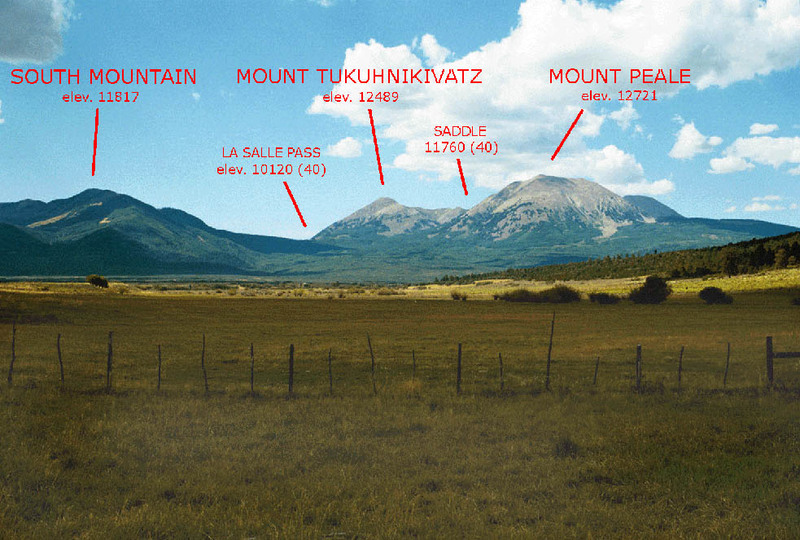 Peale is taller, has greater prominence, and is the first peak that you would climb if you were walking up the divide from Tukunikivatz's key saddle. Tukunikivatz is a subpeak to Peale in much the same way that Liberty Cap is a subpeak to Mount Rainier, or that the North Peak of Mt. McKinley is a subpeak to the main summit. Visual impact aside, how do we qualify this relationship? Say that you were to follow the critical path along a ridge from a summit, across its saddle, to the first higher ground that you could encounter. Logically, your first higher ground would be an upward slope along the ridge leading to another summit. In the rising-sea-level analogy, after we raise the sea level to the height of a summit; the first higher ground across the (now submerged) key saddle is a distant shoreline (and therefore always a slope). The first summit that we would reach on this slope (the apex of the unique slope line along that ridge) is termed the Line Parent (also sometimes called the next-higher-neighbor or NHN.) Every summit (that is not an island or continental highpoint) has a specific NHN. The NHN is important to the computation of lineage. An NHN is always higher than a summit, is always on the far side of the key saddle, and is always at the apex of a unique slope line on the ridge that first exceeds the elevation of the summit. One would find the NHN from the KS by following the slope line upward until a summit is reached. This process would be repeated until one first reached a summit whose elevation exceeds the original summit. This NHN may be an insignificant bump, a hill, or a major mountain with greater prominence than our summit. This depends on one's criterion for what constitutes a summit. In this way, the specific selection of an NHN is scale dependent. For example, we can employ a 300' qualifying rule as to what the first line parent is. In this manner we can say that Mt. Peale is the first line parent of Tukunikivatz at 300'. This is abbrieviated as "Peale is the NHN300 of Tukunikivatz." In this example the NHN300 is self-evident. In the photo, our eye ignores all of the minor outcroppings along the ridge line, and looks to Peale as the first higher summit. In practice however, it would be impractical and trivial to compute the (often unnamed) 300' rises that are the first line parents of a mountain. As datasets generally employ a minimum prominence criterion, we can default to that prominence in establishing the Line Parent. For example, a list of U.S. P2000s might name the NHN2000 for each peak. In this manner we can describe a continuous string of line parents that lead from each summit to the highpoint of the island or continent. San Gorgonio Mountain (E=11,499', P=8,282') is an example of a summit with a more distant line parent than that of Mt. Tukunikivatz. San Gorgonio is the highest point in Southern California. Its key saddle, Soledad Pass, is the low point on the ridge connecting the Southern California Mountains to the Sierra Nevada. The first higher ground is on the upper slopes of Olancha Peak, 134 miles to the northwest. In this instance Olancha Peak (E=12,123', P=3,123') is a smaller prominence summit on the ridge (Sierra Crest) that ultimately leads to Mount Whitney. We demonstrated that Mt. Tukunikivatz is on the slope of Mt. Peale, but would we say with equal confidence that San Gorgonio is on the slope of Olancha Peak? Olancha Peak is a comparatively lesser summit. Prominence helps solve this perceptual problem: we can look to the first higher line parent that also has more prominence as a second kind of natural "Parent". The Prominence Parent (PP) would be the first summit across the key saddle that has more prominence. So Olancha Peak is the NHN for Gorgonio, but Gorgonio's PP is Mt. Whitney (E=14,495, P= 10,075'), a parent more worthy of the distinction. Is San Gorgonio therefore on the slope (or "flanks") of Mount Whitney? It is, in the same sense that all of California forms a continuous terrain manifold that slopes upward to its culmination at the Whitney summit. The PP relationship helps us visualize where this slope function applies, and where it does not. A third unique "parent" relationship also bears pointing out. This we call the Island-Parent (or IP), and it is a function of that mental device that we already referred to as the Prominence Island. Consider the prominence island that was formed by Mauna Loa at the 6,600' contour. At the point that water divided the two volcanoes, Mauna Loa became the highpoint of its own island, and Mauna Kea remained the highest point of the island on the opposite shore to Mauna Loa's key saddle. This is the IP, the high point to the parent landmass of a summit's prominence island. The IP is the most useful way to consider the parent of a minor summit on the flanks of a great volcano. Althought there may be higher and more prominent bumps along the ridge leading to the summit, the IP measure ignores them and simply compares the bump to the volcano's top. Mauna Kea happens to be the NHN, PP, and IP to Mauna Loa; a frequent circumstance in the data. Whitney is a natural parent to San Gorgonio, but it is not the IP. That is to say, at 3,220' elevation when the sea water separates Southern California from the rest of North America, Whitney would not be the highest point of the opposing land. The IP to an Gorgonio is actually Pico de Orizaba (E=18,409, P=16,070) the highest point in Mexico. So while the IP has an intuitive feel in the instance of a minor subpeak on the flank of the volcano, it is less intuitive in many complex continental topographies. Gorgonio "goes to" Orizaba and skips Whitney, which does not satsify our desire for an intuitive, natural parent definition. The IP is calculated by just one criterion, it is the first line parent whose key saddle is lower than the summit's key saddle (and by extension all intervening) saddles. In many cases the IP is a trivial statistic. Any coastal hill in North America with a key saddle <84' elevation has Aconcagua as its IP. Meaning that its key saddle only separates the summit from the rest of the pan-American continental landmass. IP does not mean much in such situations. Lineage synthesizes the three parent relationships in a coherent model. The Lineage of a mountain is the string of all line parent relationships that connect the summit to its continental or island highpoint. Employing the rule for Line Parents, one can list every successively higher hill in a non-arbitrary fashion. And on this string, one can always identify a summit's NHN, PP, and IP. Every point on any summit, ridge or slope has a discrete lineage. Channels, pits, saddles, and flat bodies do not have discrete lineages, because there are two or more slope lines that ascend from the starting point. Table 10 gives a complete NHN300 lineage chart for Downtown San Francisco; every successively higher hill from the city to the highest point in the Americas. Table 11 gives a complete NHN2000 lineage chart for Capitol Hill, Washington DC. (Note the distance along the divide from Capitol Hill to the first P>300' hill.) - the author would be grateful to anyone offering to compute all of the NHN300s. Loma Prieta is an example of a peak in Figure 10 with three different parent relationships. Loma Prieta is highest point in the Santa Cruz Mountains (E=3,786', P=3,426'). Mt. Stakes is Loma Prieta's NHN300, as it is the next summit on the chart. Copernicus Peak is Loma Prieta's NHN2000', although it is not more prominent. San Benito Mtn. is Loma Prieta's PP, as it is the first summit with greater prominence. Mt. McKinley is Loma Prieta's IP, as it is the first summit whose key saddle is lower than Loma Prieta's key saddle. By comparison, Mt. Logan, the highest mountain in Canada, counts Mt. McKinley as its NHN, PP, and IP. Lineage Charts are always convergent, never divergent. The two lineages in Tables 10 and 11 converge on Mt. Whitney, and thereafter remain identical. Thus a lineage chart is also a mathematically robust tree (although it is important to note that this lineage tree is different than a divide tree in both content and method.) A lineage tree employing a standard prominence cutoff such as P300', is similar in form to a genealogical tree of descendents. The common ancestor is the highest point of a given terrain. A mountain that counts that common ancestor as its NHN would be a first-generation descendant, and so on. This model is called a Lineage Key, as it is the key to the parent relationships between summits. A useful lineage key starts with a minimum prominence cutoff. Take for example, the dataset of 1,234 2,000' prominence U.S. summits. The highest summit on this list is Mt. Whitney. Eight mountains on the list call Whitney their NHN at the P=2,000' level (the NHN2000). They are Mt. Elbert, White Mtn. Peak, and six Sierra summits. 16 peaks are two generations removed. The furthest descendent from Whitney on the list is 23 generations removed, but this is a trivial fact as the number of generations is entirely scale dependent. The San Francisco lineage reveals rules that are common to all lineages. There is often a succession of minor summits immediately preceding a high-prominence summit. The lineage tends to then jump quite a distance to the next group of summits; a function of the high degree of correlation between prominence and distance or isolation. For example, San Benito Mtn. is the highest point on the San Francisco lineage until the Mt. Pinos region. There follow five successively higher minor summits that lead (in a non-linear fashion) to Mt. Pinos. After Mt. Pinos, there is no higher ground until the Olancha Peak region where eight minor summits lead (in a straight-line this time) to the summit of Olancha. After Mt. Whitney, most of the prominences are huge; leading one to wonder if there is a correlation between elevation, prominence, and the centrality of mountains to a continental lineage. In this particular instance, the mountains after Mt. Whitney are mostly neotropical (Mexican) volcanoes and high arctic mountains, both of which presumably have few sub-peaks on their flanks. Perhaps prominences trend higher because high elevations correlates to more rugged terrain.